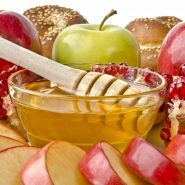 In that post, I quoted Rabbanit Oranit Pijo who says that women don’t need to go to shul to have a meaningful Rosh Hashana, since we have an innate ability to connect with Hashem through our role preparing for the holiday in the home and caring for our children. My friend wrote: “Sorry, sometimes my ‘innate ability to find spirituality within the physical’ disappears (goes to shul?) leaving me alone with the kids and housework.. I could relate to her question because I also used to have a hard time with this when my big kids were little, and it’s been a journey of many years and classes and books and prayer sessions to get to a point where I really don’t feel that struggle much at all anymore. Over recent Rosh Hashanas, if, for whatever reason, I haven’t been able to make it to shul at all (except for the shofar blowing, which women are required to hear) Rosh Hashana has still felt meaningful and uplifting and real. Yesterday I was reminded of one of the most important skills I learned to enable this shift in me. Nights have been getting a little chilly here, so yesterday afternoon I got out the thick winter blankets and covered them up with new blanket covers and arranged them on all of my kids’ beds. As I lay them out, I thought of the dangers that fill the world, and felt a deep feeling of satisfaction that I was enabling my kids to stay warm, safe in their beds, protected from the cold. Cuddled up underneath their thick blankets scented with laundry detergent. And that warm-blanket feeling is the feeling, I think, that Rabbanit Pijo was describing, finding spirituality within physical work. Over the past 18 years of motherhood, I have learned, if I focus, how to feel that joy and satisfaction when I give a child a bath, or make matzah balls, or set the table for a holiday meal, etc. It doesn’t always work. I have changed thousands of diapers and cleared millions of dishes and made countless pots of chicken soup which felt totally and completely blah. But when I do manage to do it, when I manage to focus and feel that sweetness, that spirituality within the physical act, that feeling that I am a JewishMOM creating a Jewish home full of Hashem’s light and smile, it lifts up everything to another dimension entirely. Leah, Hashem has given us a gift to truly love being at home. It’s rare but it’s a gift and it does not mean it’s our’s forever. Thank Him and daven for the continuity of gifts that make you wonder why you are different. I’m washing dishes – again. Sorting their clothes out – again. Again, again, again – I’ve swept this floor. A smelly diaper – again. Time to make dinner – again. Didn’t I just do all this before? It gets hard to remember each day’s different. Each load of laundry feels like the same chore. Remind me that each moment holds a brand new test. Too often I don’t see it anymore. True, every day I do the same things. But as time goes further on – there’s something strange. It becomes like the tefillot I repeat each day. They sound the same, but inside there’s a change. I’m washing dishes – yippee! Sorting their clothes out – yippee! Again, again, again – I’ll sweep this floor! A smelly diaper – yippee! Time to make dinner – yippee! Am I the same one who did all this before? With the music flowing stronger every year. Its never-ending work. It’s an Unfinished Symphony. But it took many dishes washed `til that came clear! Bracha Goetz is the author of 32 children’s books, including Hashem’s Candy Store, Let’s Stay Safe, and Let’s Appreciate Everyone! that can be found here: http://www.amazon.com/author/spiritualkidsbooks-brachagoetz. you made me cry, thank you bracha! I remember many years ago when I was in seminary, a woman told me that if a woman couldn’t find happiness washing the floor there was something missing in her as a woman. I was deeply offended at the time. I wanted to be out in the world doing “things that matter” like working and going to shul. But, after fifteen years of marriage- I understand her more. I was jealous of my husband for many years and then one day I realized – being a man is tough too. Just in a different way. He doesn’t run to shul excited every day any more than I get excited making lunch for the seven thousandth time. But he does it. And I do it and every so often it gels into something amazing. Those days are a gift but we only get them because we have been doing the work all the time. Love this article and the poem by BG- so true! Thank you and please keep these types of articles coming. I’d so love – need – to feel the connection, the ruchniyus in all the gash miyus (trantrums, diapers, lack of sleep, etc). BH. There was a really nice article in last week’s mishpacha about a mother that had no more excuses not to go to shul, and she was quite ambivalent about not being needed at home anymore, about going into a new “older” phase in life. A nice perspective for all of us! !